desalojos de la ZAD y desde lejos enviamos nuestra solidaridad. La ZAD – Zone A Defendre.- es una zona liberada del capitalismo que comenzó como una ocupación de protesta para evitar la construcción de un aeropuerto cerca de Nantes, en Francia, y creció hasta convertirse en una zona autónoma, donde se ha creado una auténtica sociedad alternativa, radical, práctica e imaginativa. We are shocked, angered and heartbroken to hear the news of the on-going eviction of the ZAD. From a distance we send our solidarity. The ZAD – Zone A Defendre.- is a zone liberated from capitalism that began as a protest occupation to prevent an airport being constructed, and grew into an autonomous zone where a real radical, practical, and imaginative alternative society has been created. 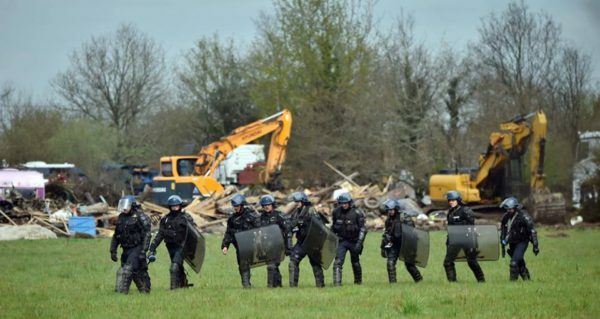 The ZAD won its campaign to prevent the airport being built, but on Monday morning 2,500 militarised police moved in to destroy and evict this alternative worlds that had been created there. People from the ZAD have come to Can Masdeu to share the stories of their inspirational struggle, and although we may only have personal connections with a few of the Zadists – we count the Zadists as friends, comrades and co-conspiritors in the movement to create self-organised, ecological, autonomous spaces within this capitalist world, a laboratory where new forms of life can be created. Whatever the outcome of this attack by the French state, the dreams and vision of the ZAD continue to live in the hearts of all those that have been touched by it, and in the stories and legends that will be told of it. We don’t know all of the forms that your resistance takes from here, but we offer our support, solidarity and comradeship. They thought they could bury us. They didn’t know that we were seeds. For fifty years, this unique chequerboard landscape was the site of a relentless struggle against yet another climate wrecking infrastructure – a new airport for the nearby city of Nantes. Farmers and villagers, activists and naturalists, squatters and trade unionists wove an unbreakable ecology of struggle together and three months ago on the 17th of January, the French government announced that the airport project would be abandoned. But this incredible victory, won through a diversity of creative tactics from petitions to direct action, legal challenges to sabotage, had a dark shadow. In the same breath that declared the abandonment, came the announcement that the people occupying these 4000 acres of liberated territory, the 300 of us living and farming in 80 different collectives, would be evicted because we dared not just to be against the airport, but its WORLD as well. Since that victorious day, the battle has transformed itself and is now no longer about a destructive infrastructure project, but about sharing the territory we inhabit. We stoped this place from being covered in concrete and so it is up to us to take care of its future. The movement therefore maintains that we should have the right to manage the land as a commons (see its declaration The Six Points for the Zad because there will never be an Airport). Today this is the struggle of the zad (zone to defend) of Notre Dame Des Landes.